The skill of the surgeon and the latest technology can achieve excellent results. It’s like a miracle – a man regains his freedom from glasses and contact lenses. Surgeons of the clinic Dr. Solomatin own all known methods of laser vision correction. Experience and skills of our specialists allow us to select an optimal method of vision correction for each patient, which can provide the maximum possible result. Most of the operations for laser vision correction in our clinic are carried out using the LASIK method and its modifications. The LASIK method is one of the most popular methods of vision correction in the world. According to the American Academy of Ophthalmology, more than 3 million such operations are conducted in the United States alone each year. In addition to the LASIK method, laser correction methods such as Femto-LASIK, EPI-LASIK, PRK, LASEK and others are used. The operation for vision correction is carried out in two stages. During the preparatory phase, the eye is prepared for laser treatment. A surface is formed which, during the second stage of the operation, processes the laser beam. During laser correction, the optical properties of the cornea, the main lens of the eye, change. Treatment is in accordance with an individually developed program of laser vision correction. During the operation, the patient fixes his eyes on the colored lights. The operation is painless and passes quickly – directly laser exposure takes an average of one minute on both eyes. Get free of glasses and contact lenses! Enjoy the momentary effect of the operation! Correction of vision – painless procedure, allows you to quickly return to the usual rhythm of life! The laser beam corrects sight on average in just one and a half minutes! During the operation, drip anesthesia is used, so the unpleasant sensations are almost completely absent. The very next day after the operation you will be able to work with a computer and live an active lifestyle. There is no need to specifically take a vacation or make out a sick leave sheet. 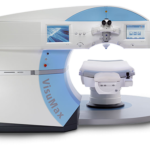 The laser system is equipped with a system for tracking the smallest movements of the eyes. The laser beam responds to eye movement and adjusts. This ensures the highest level of security of the operation. Laser correction of vision for each patient is carried out according to an individually prepared program. During the preparation of the vision correction program, the data obtained during the detailed eye examination are used, using very accurate computerized equipment. Improvement of vision the patient notices immediately after the operation. For several hours (depending on the individual reaction), vision is noticeably better. The final stabilization of sight comes in a few months. Patient’s age: 18 to 45 years. Age is a relative contraindication. There are exceptions, which depend on the individual anatomical features of the eye. Laser eye surgery enables you to start a new life without glasses and contact lenses.